Sorry... the 2017 Volkswagen Passat is no longer being sold as new. 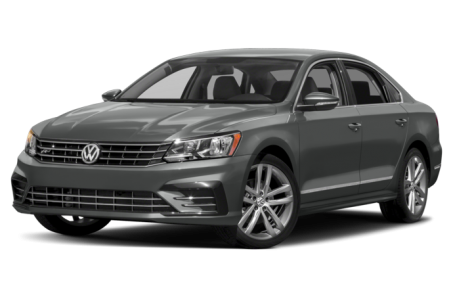 Instead, take the first step to a great deal on 2019 Volkswagen Passat with a free price quote! The 2017 Volkswagen Passat is a mid-size sedan with turbo 4-cylinder and V-6 engine options. It competes with Mazda Mazda6, Honda Accord, and Hyundai Sonata. This year, it receives additional standard safety features and a V-6/SE trim model. Four trims are available: the S, SE, SEL Premium, and R-Line. Unlike other mid-size sedans, the Passat has more conventional, understated styling. The front grille stretches out to align with the headlights end-to-end. The outer edges of the front fascia are slightly flared out for more visual interest. A long, sleek body line extends across the side from the headlight to taillight. Power side mirrors with turn signal indicators and 16-inch alloy wheels come standard. Heated side mirrors, a rear spoiler, and LED lighting for the headlights and daytime running lamps are also available. The R-Line trim has sportier exterior styling and unique 19-inch alloy wheels. Under the hood, the Passat is powered by a 170-hp, turbocharged 1.8-liter 4-cylinder engine mated to 6-speed automatic transmission. A more powerful 280-hp, 3.6-liter V-6 is also available paired with a manual or a 6-speed dual-clutch automatic. Fuel economy for the 1.8-liter model is an EPA-estimated 23/34 mpg city/highway. It lowers to a 20/28 mpg rating for the V-6 model. Inside, the Passat has a premium cloth interior with a 60/40 split-folding rear seat. The center stack houses a standard MIB II infotainment system, which includes a 5-inch display, Bluetooth connectivity for phone and audio, and a USB port. It can be upgraded with a larger 6.33-inch display, an integrated navigation system, Apple CarPlay/Android Auto compatibility, and Car-Net App-Connect services for roadside assistance, crash notifications, stolen vehicles location assistance, and speed/boundary alerts for parents with teens. Standard features include air conditioning, cruise control, and power windows/locks. Leatherette seating, a power moonroof, dual-zone automatic climate control, power/heated front seats, heated rear seats, and push-button start are available as well. The Passat earned a full 5-star overall crash test safety rating from the National Highway Traffic Safety Administration (NHTSA). Forward collision warning and autonomous emergency braking are now standard. Available features include a blind spot monitoring system with rear cross-traffic alert and adaptive cruise control. 67 of 70 (95%) consumers said they would recommend this vehicle to a friend.